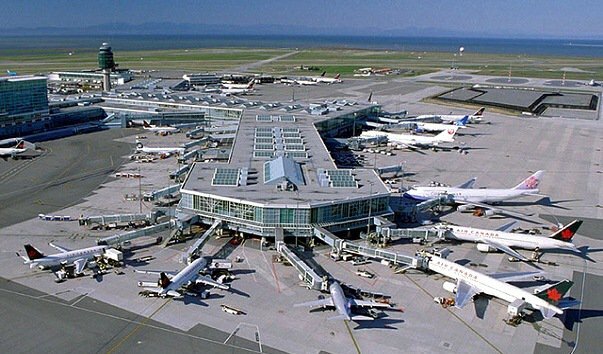 In this section, you will find tourist reviews about Vancouver airport, as well as information about wireless Internet access, presence or absence of lounges, amenities and services … and yes, even the names of some hotels at the airport in case you decide sleeping at the airport is unacceptable for you! To help you plan your arrival or overnight stay, we have compiled a brief guide based on the feedback from travelers who have visited Vancouver Airport. Large, bright and modern international airport. The airport consists of one large interconnected terminal, which is divided into 3 sections: Domestic, Transborder and Internation. There are many shops and restaurants to choose from. 24-hour food items available! The interior of the airport is warm and welcoming, with fountains and lots of local, world art. The airport provides free Wi — Fi. Common area: the seats do not have armrests, so that you can stretch out. Common Area: The International Area has the best leisure options with various options. Controlled area: reviewers found comfortable seating areas near the baggage claim (benches without armrests). For a full, long sleep, there are hotels near the airport. See more in the airport manual, see hotels below. Passengers traveling economy class, can purchase for an additional fee a place to stay in specialized airport lounges. For more information about the location of rooms for recreation, services and cost of the hall, see the guide to the airport. For more information on the available services and facilities of Vancouver Airport, scroll down. Send us your airport reviews to help us improve this information. In the guidebook we will use the following terms: “common access zone” and “air zone”. The common access zone is a public area located in front of the pre-flight security control zone. Airside — the protected area of ​​the terminal, where you get after passing pre-flight control. If you are traveling in economy class, you can use the one-time ad hoc services or use your membership in this or that program to take advantage of the special facilities of Vancouver Airport for a comfortable wait. For more information (such as cost, opening hours, and membership information), use the detailed hall descriptions below. More information about the location of the halls of comfortable waiting, cost. Plaza Premium Lounge — Location: Domestic Departures, Landside, Level 3, near Gate B15. Showers are available. Access to the waiting room: by pass ($ 44 — 3 hours or $ 64 — 6 hours). Plaza Premium Lounge — Location: Domestic Departures, Landside, Level 3, near Gate C29. Access to the waiting room: by pass ($ 44 — 3 hours or $ 64 — 6 hours). Air Canada Maple Leaf Lounge- Location: Domestic departures, Landside, Level 3, near Gate C29. Access to the lounge: Maple Leaf Club • Air Canada ticket holders can purchase a pass at the time of booking or check-in online. Plaza Premium Lounge — Location: International Departures, Common Area, Level 3. Showers are available. Access to the waiting room: by pass ($ 44 — 3 hours or $ 64 — 6 hours). Air Canada Maple Leaf Lounge- Location: International Departures, Landside. Access to the lounge: Maple Leaf Club • Air Canada ticket holders can purchase a pass at the time of booking or check-in online. Plaza Premium Lounge — Location: US Cross-border Departures, Shared Area, Level 3, near E87 Gate. Access to the waiting room: by pass ($ 44 — 3 hours or $ 64 — 6 hours). Air Canada Maple Leaf Lounge- Location: United States Cross-border departures, Landside. Access to the lounge: Maple Leaf Club • Air Canada ticket holders can purchase a pass at the time of booking or check-in online. Free Wi-Fi is available at Vancouver Airport. 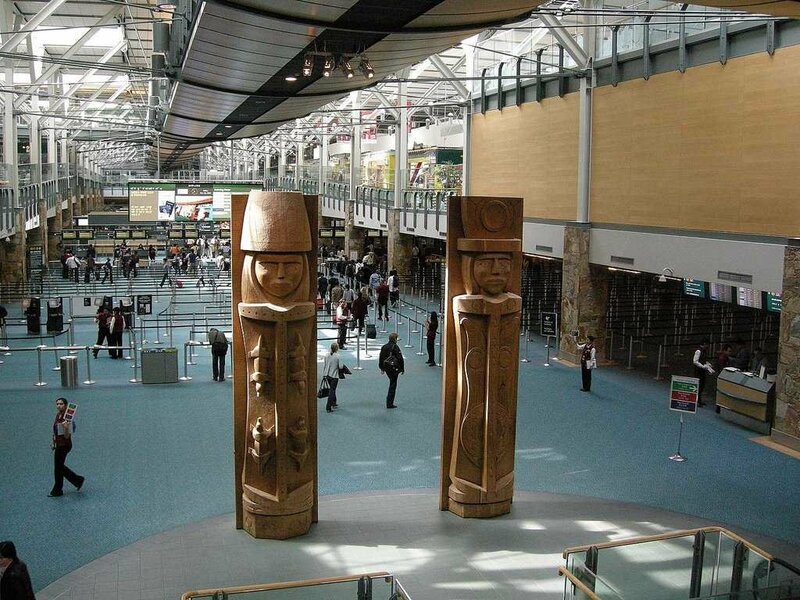 Fairmont Vancouver Airport — (10 minutes walk from the Inland Terminal). Located inside the International Terminal. Pacific Gateway Hotel Vancouver Airport — (5 minutes from the airport). Free 24-hour transfer. Days Inn Vancouver Airport — (8 minutes from the airport) Free 24-hour transfer. Radisson Hotel Vancouver Airport — (10 minutes from the airport). Free 24-hour transfer. To find a cheap room in a hotel in the Vancouver airport area, we recommend using the Tripadvisor website, where the feature is available — sort by price. ATMs — Location: International Arrivals (next to ICE currency exchange) • International Departures (next to ICE currency exchange) • Domestic Arrivals (next to Tim Hortons) • Domestic Level 1 (at 7-11, Scotiabank is only one at the airport ) and others scattered across all terminals. Banking — a full range of services is provided by Royal Bank of Canada (RBC). Location: Internal Terminal, Level 3. Hours: 9:00 am — 4:30 pm (Mon-Fri). Car rent — Yes, see our transport section below. Chapel — Collect your thoughts about peace in the interfaith chapel. Location: International Terminal Level 2. Children’s Playground — Location: Food Court Domestic Terminal • Domestic Terminal, Gate 3 and 43 • International Terminal — Gate 54 • Domestic Terminal, Level 3, Gate 13. Currency Exchange — International Currency Exchange (ICE) is available in all Terminals. Duty free Shops — A variety of duty free shops are available in the Common Zone at level 3 (US and International Terminals), in area D (International Terminal) and E85 Gate (US). Food and Drinks — Catering facilities throughout the airport operate with different schedules. Available points with a 24-hour work schedule. Information desks — there are 12 customer service desks throughout the airport, with representatives available 24 hours a day. Mobile Charging — Mobile charging stations are available near the gate throughout the airport. Showers — Available in waiting rooms. See the information above. Spa — Manicure, facial, massage and other beauty services are provided at Absolute Spa. YVR is served by Whistler, Victoria, Duke Point (Nanaimo) regional buses on Vancouver Island, the Gulf Islands and the Washington State in the United States. Licensed taxis are available in the taxi zone, which is located at level 2 of the arrival zone of domestic and international terminals. Some of the hotels that offer airport transfers are: Accent Inn Vancouver Airport • Best Western Plus Abercorn Inn • Coast Vancouver Airport • Days Inn — Vancouver Airport • Executive Airport Plaza Hotel Conference Center Richmond • Four Points By Sheraton Airport Vancouver • Hampton Inn By The Sea • Downtown Vancouver • London • Airport • Vancouver Airport • Sheraton Vancouver Airport • Sheraton Vancouver Airport Hotel • Vancouver Airport Marriott • Westin Wall Center Vancouver Airport. Следующий What does a dream house of different signs of the zodiac look like?